Sometimes it is the simplest of words that can jump out and touch our minds and hearts. Often, those words convey truths that already live inside of us, however, we have never fully comprehended the potential or power of that truth. Today I was hit by a zinger by none other than Mother Angelica. 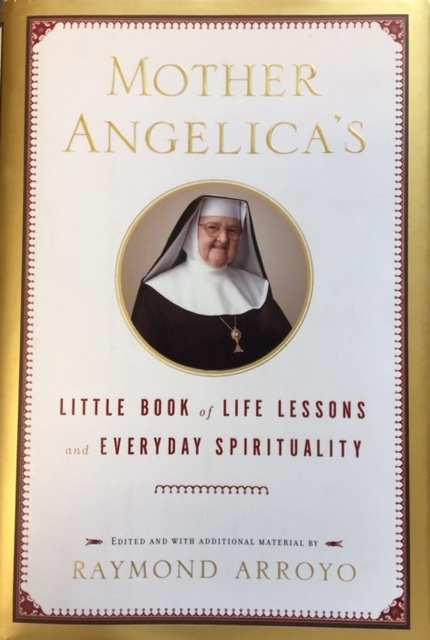 I am reading one of her books, “Mother Angelica’s Little Book of Life Lessons and Everyday Spirituality.” This book is filled with page after page of wisdom, written for all Christians…not just Catholics…in case you were wondering. Wow…an extremely simple and powerful thought. How do we portray Jesus in our daily walk? When we cross paths with the homeless, when someone is rude to us, when we are feeling triggered by words or actions, when we are stressed, when we are suffering, when someone doesn’t understand our intentions or beliefs, when someone aggressively disagrees with us, when things aren’t going our way??? We have all gone through those situations. There are many times that I have been angry, disrespectful, apathetic, and unforgiving. How blessed we are, that we can ask forgiveness from God, and not only be forgiven, but blessed in a way that helps us to repent from our hurtful thoughts and actions. How can we show “Jesus” to our family and all those that we cross paths with? For me, the most important step is to pray that the Holy Spirit works through me, and touches those on my path with His love…whether I am aware of it or not. Meaning, that even when I fall short, or don’t handle a situation as well as I would have liked, He would bless those I encounter with His love and mercy. And that He works through me in my daily life, helping me to be a transparent person and a true Christ Follower, so that those who happen to see me without my knowledge, will hopefully see the goodness of God working through me. There are many ways that we can reveal the Jesus that lives within us to the world. I am thinking of a few, however, know that in your creativity, you will find many other ways. Make eye contact with all those you meet, including the homeless, or less advantaged…introduce yourself, initiate conversation, and if you are able, either share some cash with them, or ask if they need a meal or maybe a cold drink or a warming cup of coffee. Allow Jesus to touch them through your kindness. Let them know you SEE them…that they matter to you. Share your smile liberally. You would be amazed if you truly knew how your special smile can affect a heart…and someone’s day. Give people the benefit of the doubt when they offend or are rude to you. Take a moment to think before lashing out, and then pray for them. Give honest compliments. You know the kind…the thoughts that run through your head all the time. “What a beautiful family you have!” “You were wonderful giving that presentation.” “You look amazing in that outfit.” “You have the most beautiful eyes, or hair, or spirit.” “What a sweet dog you have, what is his name?” “I admire your strength.” “You are an awesome teacher, and I appreciate what you do.” “You are great at your job…thanks for the wonderful service.” The list goes on and on. Don’t be afraid to pass on the good that you notice or feel about a person. When there are tasks that need done, and you don’t feel like doing them, whether at home or at work, ask Jesus to work through you. Say a prayer of thanksgiving for all of your blessings and offer it to the Lord. Because, at that moment, the task at hand is God’s will for your life. Learn to find joy in that knowledge. Listen to the voice in your heart when certain names pop up in your mind. That is the voice of the Holy Spirit, prodding you. Make that visit or phone call, send a card or text to let the person know you are thinking of them and praying for them, fill a monetary or any other need that is an issue for them…always look for a way to share love. Oftentimes, it will be a small gesture, and sometimes you will be called to share something greater of yourself. Learn to look for Jesus in each and every person…look past their weaknesses and flaws and look for the good. If it is just a little flicker, focus on it and help them to understand the flicker (goodness) that lives within them. And be sure to look for Jesus in yourself, and to focus on the goodness of His love inside your heart. Bask in the mercy of his love, and your heart will overflow! Categories: Christianity, Somebody Loves Me | Tags: Catholic Church, Christians, jesus, Mother Angelica, Prayer, wisdom | Permalink. I love Mother Angelica! So true, those words are so powerful . . . I am reminded of another phrase I once read, this one being by Mother Theresa. She said, ” Never let anyone you meet leave unhappy.” Those words jumped out at me. So simple, yet so powerful It is all the same basic message – spread the love and happiness of Christ to everyone you meet. Yep. It isn’t always easy to “Be that somebody.” but so very necessary at least to try our best! This was a great post! Thank YOU so much; what an important lesson. This is very well written and impactful. We are after all the only hands and feet He has here on earth. “You may be the only Jesus your neighbor will ever see.” Thank you for reminding us of these important words, Bernadette. And I love how you gave examples on how we may do this. This is particularly important for us who write and speak. We can so easily offend or encourage someone. Have the very best day! Thanks Berni, that was a great reminder! Beautiful! Thanks Bernadette. A friend of mine put it this way: See Jesus and Be Jesus – for every one of us is made in His image. What wonderful insights. You rightly point out that the Holy Spirit is often gently placing people and situations into our thoughts or directly in our paths that he wants us to share our gifts with. Unfortunately those promptings can be missed or ignored if we are not attentive to them. It is tremendously fulfilling when we learn to respond to those nudges and see God work through us.